I love how no one stopped to think about the impact selling off the older films would have on new releases nor, even better, that the studio itself could make more money from re-issues than from the outright leasing of these titles. 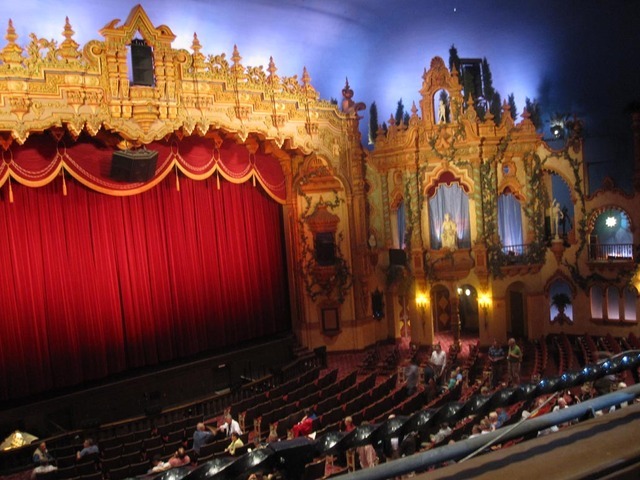 Universal was and is not the only studio demonstrating such extreme lack of forethought.Hollywood seems to have always discounted its heritage. I think one of the factors in diminishing DVD and Blu-Ray sales is that stuff we paid a premium price for when first issued can now be got a discount prices that will make anyone hesitate before spending. Probably one of the reasons Bela Lugosi (and others) had a hard time getting good, new roles was because they were up against re-releases of their older films. Adding regular television appearances to their activities in the early 1950s couldn't have helped the oversaturation of their market. 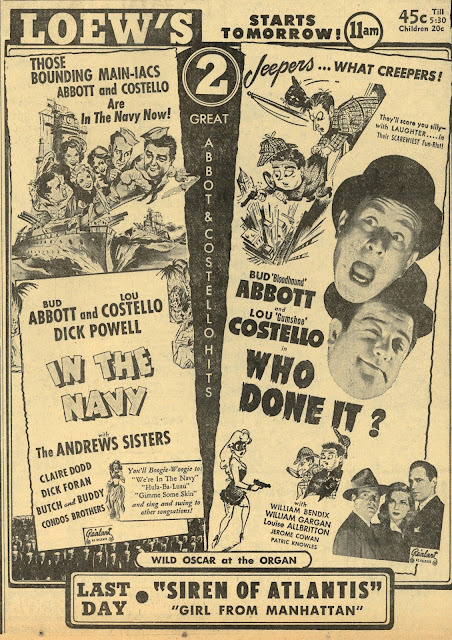 Then, the team's new films not only had to compete with their earlier product, they also had to lure audiences into theatres who could see Abbott and Costello on TV -- for nothing! I know this for a fact. The Realart booking office in the Charlotte territory was one of the busiest in the mid-Forties through the mid-to-late-Fifties. The grind houses and the drive-ins lived off their menu with A&C, Maria Montez and the monsters. And probably made more bucks than did the first run theaters. The older A&C doesn`t hold up for me. Recently recorded WHO DONE IT? off of TCM. Film is whoa-fully dated & laughs were few. But IN THE NAVY has the great arithmetic gag with support from Shemp Howard. Actually I put WHO DONE IT? at their near top. It's a comedy noir that has a fast, spontaneous feel. There are innumerably hilarious incidents, such as "The Flying Bordellos" (?! ), a funny William Bendix and Mary Wickes, plus the brilliant Alexander 2222 phone booth bit. Not woeful in the least as far as prime A&C goes. The competing-with-self thing goes back to Chaplin, when his early films were kept in constant circulation, sometimes retitled in an attempt to fool ticket buyers. In Chaplin's case the demand was so great it was more a matter of missed revenues than damage to his new films. But I think Harry Langdon suffered when a backlog of his Keystone product hit the market. That became a pattern for decades to come: A struggling actor becomes a star, and all his/her previous work -- some of it embarrassing pay-the-rent gigs -- is back on the market, with said star top-billed for secondary part or even a bit. Whatever his feelings about working on the series, Bruce Lee must have been a bit ticked when episodes of "The Green Hornet" were pasted up and marketed as a Bruce Lee action movie. Various studios shut down their animated short units upon discovering reissues performed about as well as new cartoons, and were all gravy besides. Columbia managed to make the Three Stooges compete with themselves in the same two-reeler, bringing them in for a day's work to shoot connecting footage for old clips (Did they get full salary for those?). Still, it's been a long time since any stars had such a run of successes that they competed directly for ticket sales or ratings. I remember one case when CHiPs was a monster TV hit. The first few seasons had gone into syndication. and one local station dropped the expensive new episodes in favor of the syndicated bargain, trusting the show's fans wouldn't notice. Much harder to get away with now. The real problem for actors is when a successful show is insanely overexposed in syndication, making it tough to shake a character or evade comparisons to younger, more celebrated self. Regarding Chaplin competing with his earlier work, one could blame Joseph Simmonds, who bought Charlie's Keystone shorts and William S. Hart's Triangle films, gave them new titles and re-released them as W.H. Productions. Chaplin had moved on to Mutual and Hart had his own company, and were making fewer films per year, so Simmonds filled the gap with re-releases. He would soon get in trouble with the FTC, who ordered him to disclose the original titles of the films onscreen and in ads. I mentioned in an earlier post the case of "Midnight," a Universal vehicle for Sidney Fox that had Humphrey Bogart in a small role; it was reissued as "Call it Murder" (perhaps to avoid confusion with the Ameche-Colbert film "Midnight"), with Bogie top-billed. Reminds me of how , near the end of his life, the "Elvis Legendary Performer" series of reissues sold better than his new product. I think Bruce Lee was already dead when the "Green Hornet" compilation came out.